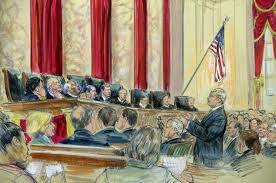 Home / CRUISING THE PAST / SUPREME COURT JUDGES RULE “PUBLIC AIRWAVES” ARE OWNED BY DISNEY, NBC, CBS, ABC AND FOX. 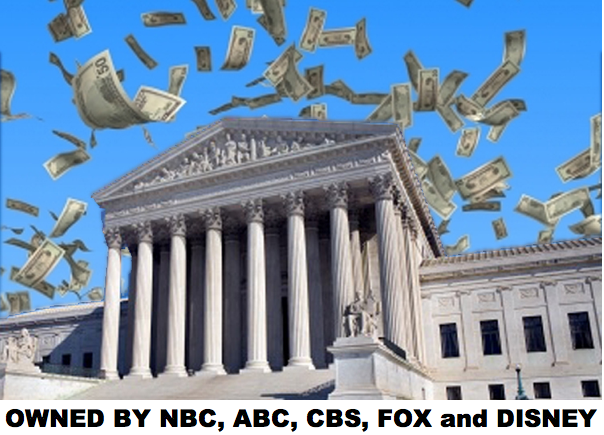 SUPREME COURT JUDGES RULE “PUBLIC AIRWAVES” ARE OWNED BY DISNEY, NBC, CBS, ABC AND FOX. Crony capitalism on Supreme Court rules that the public has no right to use America’s airwaves. 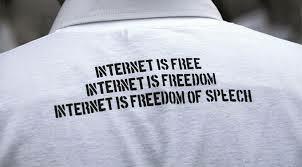 They are to remain government and 1% regulated with more damage to freedom of speech issues. In a decision with implications for the television industry, the Supreme Court ruled on Wednesday that Aereo, a start-up streaming service, had violated copyright laws by capturing broadcast signals on miniature antennas and delivering them to subscribers for a fee. ABC v. Aereo: The court ruled that it is unlawful for an Internet startup to capture and stream broadcast television signals over the public airwaves to subscribers. The court failed to say that the subscribers are victims of politically crony Washington DC where broadcasters have bought every political hack that maintain the outdated and expensive cable system along with judges to back up this process of freedom of speech. So called “liberal” freedom of speech Judges Sctomayer, Kagan, Ginsburg, Breyer, Kennedy and Roberts backed ABC, CBS, NBC and Fox to keep outdated broadcasting methods and curtail access to the public airwaves by US citizens. Judges Scalia, Thomas and Alito maintained the current broadcasting/cable system was outdated and the public airwaves should be open to any user. In arguments before the court in April, the broadcasters contended that Aereo and similar services threatened to cut into a vital revenue stream — the billions of dollars they receive from cable and satellite companies in retransmission fees, the money paid to networks and local stations for the right to retransmit their programming. The networks said this revenue was so essential that they would have considered removing their signals from the airwaves had the court ruled for Aereo. Barry Diller remains a hero to all people who have cut cable and barely watch the outdated major broadcasters dated shows on the “public airways”. Backed by the Barry Diller-controlled IAC, Aereo allowed subscribers who paid $8 to $12 a month for its service to stream free-to-air broadcast television to their mobile devices, computers and web-connected televisions. The start-up contends that it is merely helping its subscribers do what they could lawfully do since the era of rabbit-ear antennas: watch free broadcast television delivered over public airwaves. Broadcasters lambasted the start-up, claiming that the technology violated copyrights and was no more than a high-tech approach for stealing their content. ABC, CBS, NBC and Fox were among the broadcasters suing to shut down the company. President Obama sided with the 1% against Aereo and met with Internet/Broadcasting CEOs to discuss at a private White House dinner paid for by American taxpayers. 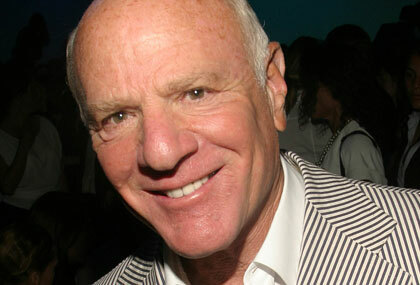 No media coverage was allowed but sources report the 1% group toasted Aereo’s demise. The Supreme Court case comes at a crucial time in the media industry, when TV companies are navigating vast technological changes and rapid shifts in viewer habits. As a result, the economics of television financing and distribution are changing. Aereo’s technology system relies on thousands of dime-size antennas — one for every subscriber — stored in local warehouses. Those antennas capture over-the-air television signals and are connected to a remote digital video recorder and Internet connections. Subscribers pay to rent an antenna, which they control remotely from their computers, smart-phones or other devices. In other words, the public be damned and let them eat cake.